Habit: Annual, short-lived, generally tufted. Leaf: basal, simple, linear. Inflorescence: scapose, 1-flowered. 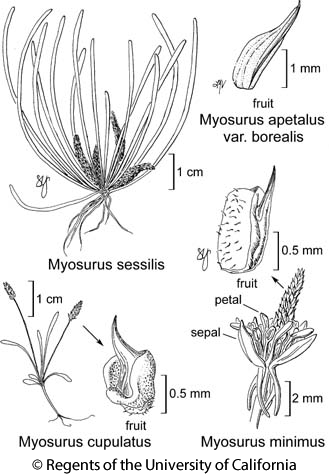 Flower: sepals (3)5(8), 1.5--4 mm, alike, free, green or scarious-margined, spurred; petals 0--5, free, linear to narrowly spoon-shaped, long-clawed, white; stamens 5--25; pistils 10--400, 1--2.5 mm, ovules 1, styles thread-like. Fruit: achene, angled, wall not veined, styles persistent, +- enlarged in fruit; receptacle elongate, generally growing and producing ovules after flower. Habit: Plant 3.3--16 cm. Inflorescence: scape 2.2--12 cm. Flower: sepals +- 3-nerved, scarious margin narrow or 0. Fruit: outer face 0.8--1.2 mm, 0.6--1 mm wide, round, occasionally square, bordered with prominent ridge; beak 0.6--1.2 mm, +- divergent from fruit surface; aggregate 13--42 mm, 2--3 mm wide, long-exserted from leaves. Citation for this treatment: Alan T. Whittemore 2012, Myosurus cupulatus, in Jepson Flora Project (eds.) Jepson eFlora, http://ucjeps.berkeley.edu/eflora/eflora_display.php?tid=34223, accessed on April 23, 2019.
e DMtns; Markers link to CCH specimen records. Yellow markers indicate records that may provide evidence for eFlora range revision or may have georeferencing or identification issues. Purple markers indicate specimens collected from a garden, greenhouse, or other non-wild location.